Bob joined the Meramec Valley Grotto in November 1986 when Keith Goldacker was President and Virginia Day was Membership chair. Bob was a printer by trade. From January, 1989 to his death, Bob was the Editor of The MERAMEC CAVER and NEVER missed an issue. Probably no NSS Grotto Editor has endured that long. That is 210 CAVERS in a row!!! He introduced the eCAVER as a convenience for us, and to save the grotto money; while increasing his own workload. Bob was in the forefront of the Computer Age. He bought high dollar PCs and software and taught us to follow. He created our famous website and introduced MVG to the world, and made it easy for us to post messages (such as this one) to the "Whole Dang List". Bob was one of the principals of Club 69, a caving social non-organization whose primary purpose is the creative promotion of fun, zaniness and fellowship amongst people who truly believe if you're too busy to have fun...you're TOO BUSY. He was rarely too busy to chat on the phone, play darts, or visit a Mexican restaurant, while hatching some new scheme to make the world just a hair more unique than usual. He aided the Missouri Caves and Karst Conservancy with their website, as well as being a database guru, keeping membership records and helping others with their recordkeeping. Bob caved actively around here and in Mexico for awhile and then his creativity shifted to enhancing the website with fun graphics, pictures, stories, Club 69 stuff and tools. He quit bringing caving gear to MVOR so he could enjoy the social aspects of those events. Lucky are those who went on a "Pickle Run" with him. Bob's smoky campfires became legendary where partiers still on their feet would stagger by for a cup of his early morning coffee. He began doing guidebooks for MVORs, then joined-in producing Club 69 MVORs where "normal" had to be redefined. The outpouring of his graphics and creativity bloomed, yet you'll seldom find his name anywhere except in fine print. He loved to travel. And everywhere he went there were pictures and tales to share... which is pretty much the theme of Bob's life and love of MVG. He loved us and asked nothing in return. 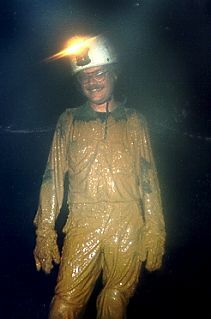 Bob was married twice-- the first union produced one son, Jason, and the second marriage to his 'best friend' Betty, a fellow caver, made him extremely happy. That boy is gonna leave a hole bigger'n any cave we've ever been in, but we've sure enjoyed our time with him. We love you too, Bob. Until we meet to raise our coolies skyward again, this campfire's for you. Written by Earl and Lannis Hancock, with a little help from a certain cavefish.